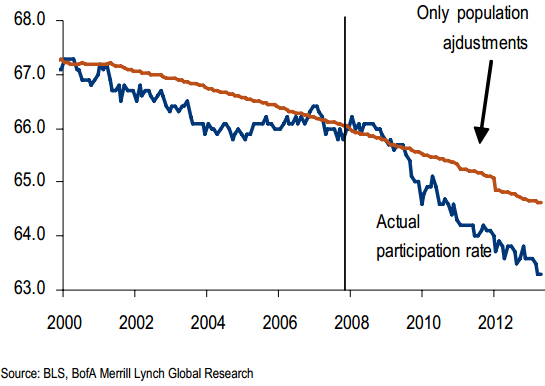 Much has been made of the declining labor participation rate in the US. What is not always made clear however is that about half of those declines is simply the result of aging US population. Clearly cyclical forces have been at work in recent years as people drop out of the workforce. But over the log run demographics win out. Given the recent weakness in US labor markets and a considerable labor slack, it may sound a strange to some that the US may be facing labor shortages in the future. Growth rate of the working-age population has been declining and will ultimately put a cap on the rate of US economic expansion. JPMorgan: - The growth rate of labor supply has slowed sharply over the past decade. And while some of that slowdown is cyclical and reflects unusually weak labor markets, a large part is secular. Growth of the working-age population is on a slowing trend, and the trend in labor force participation rates is gradually lower. According to the February 2013 CBO estimates, for example, potential growth of the labor supply has been irregularly slowing from 2.5% annual growth from 1974-1981 to only 0.8% from 2002-12 and is projected to slow further to only 0.6% over the next five years. The slowdown in potential labor force growth has been accompanied by a similar slowing in actual labor supply. Potential labor supply is expected to slow to only 0.6% per year from a longer-term average of 1.5%. That is why progressive immigration policies are crucial for the US. Consider for example a simple mental exercise of slowly "turning off" the contribution of immigration. Under the current immigration policies, the US population growth is expected to slow considerably over time according to the US Census Bureau. But if one phased out immigration altogether over a 30-year period for example, population growth would collapse and the US economy would be in trouble. Another way to think about the problem is to consider the "population pyramid". Below are the current projections for the US and Japan out to the year 2050. The major difference in demographics of the two nations is immigration - which accounts for a great deal of the difference in the future shape of the population pyramids. It is difficult to imagine the crisis Japan will face, as a relatively small working age population will be supporting increasingly larger numbers of retirees. Japanese companies will be forced abroad just to sustain their employee count. And that doesn't even begin to address the government debt, the burden of which will fall on an ever smaller group of workers. Clearly the US must make an effort to avoid such a scenario. But even under the current immigration rates, the US economic growth will slow materially due to labor shortages. JPMorgan: - ... barring major unanticipated increases in immigration, labor supply considerations alone point to a future trend growth of the economy that will be well below the norms of the past 50 years. Any tightening in immigration policies could prove disastrous in the long term.